Today, I´d just like to say THANK YOU! to all those people who have visited Mappalicious in the past (and hopefully, will continue to do so…). Why? Because yesterday has been the most successful day ever for my little blog project, and also August 2015 has been the month with the most visitors and page views – by far. All in all, more some 11,000 visitors created 16,000 page views during that period. Now, 11.000 visitors in a month is literally nothing compared to the numbers of big news outlets or super-successful blogs like Brainpickings – but Mappalicious is just my little fun project that I run on the side, while being a corporate manager, part-time coach/speaker, and of course husband and dad. To me, it just feels incredible to be able to put my brilliant thoughts the brilliant thoughts of other people on this page so they can be found and read by friends and total strangers all over the world. 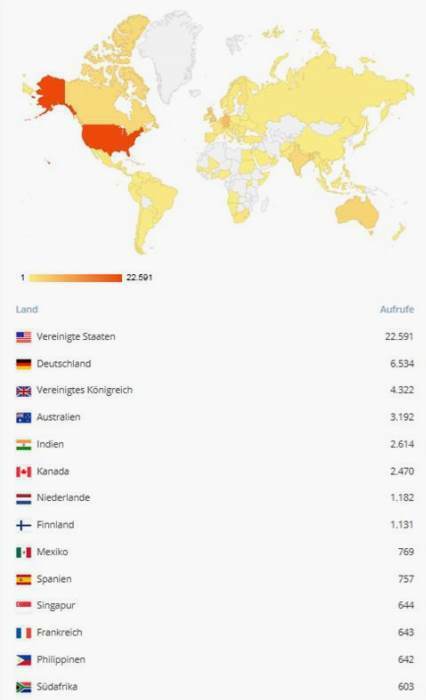 I´m from this tiny town in Germany, and thanks to my participation in the Penn MAPP program, suddenly people from literally all over the world read my stuff. Isn’t that absolutely fantastic? Via the graph (click to enlarge) you can see where most of my page view came from this month. I find it absolutely staggering that, for instance, somebody in Jakarta will be able to read these lines once I´ve clicked on “submit” in a couple of minutes from now. This is the true power and upside of the internet: giving those people a voice who otherwise would not be heard.